How to get there? By car or by bus. What to bring? Well, shoes to walk comfortably in. What else? The walk up the hill is quite hard for someone as unsporting as me, so take your time. 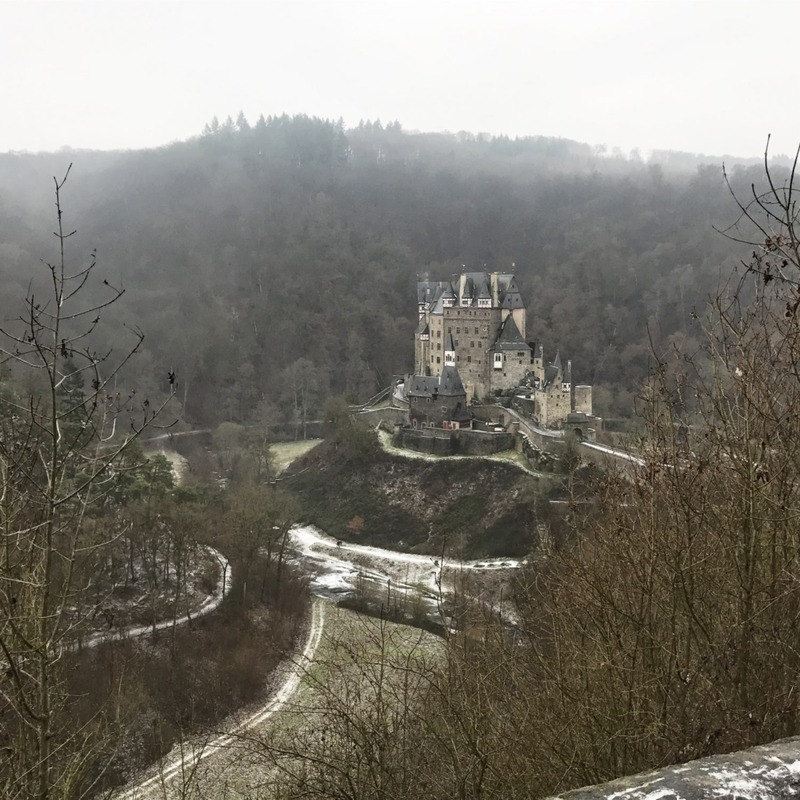 Just half an hour drive from the lovely suspension bridge that I told you about last week you can find the amazing Burg Eltz. Burg is the German word for castle and it indeed is a lovely one. Also here there is a parking space, where you can leave your car. In winter no one is there so parking is free and space is more than enough. If you go there in Summer I heard it is the absolute contrary. To get to the castle there is a small walk. I must be honest, I am absolutely not a sportive person, so I can tell you if I made it, you can make it too. 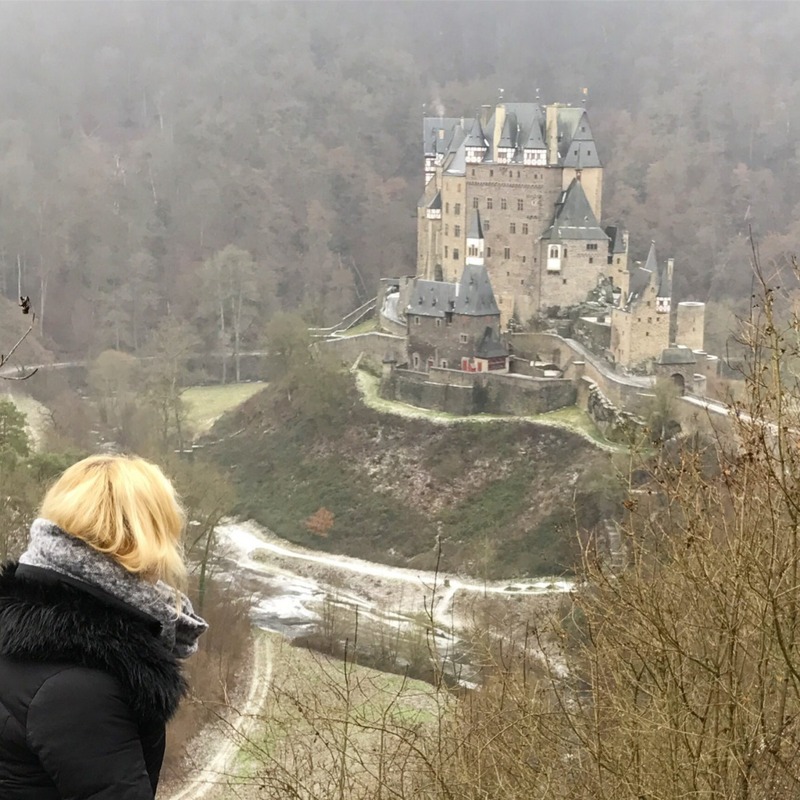 The walk brings you down the hill, first passing by a small viewing location, where you can see the Burg Eltz with all it’s surroundings. Following down the path you’ll arrive at the doors of the castle. 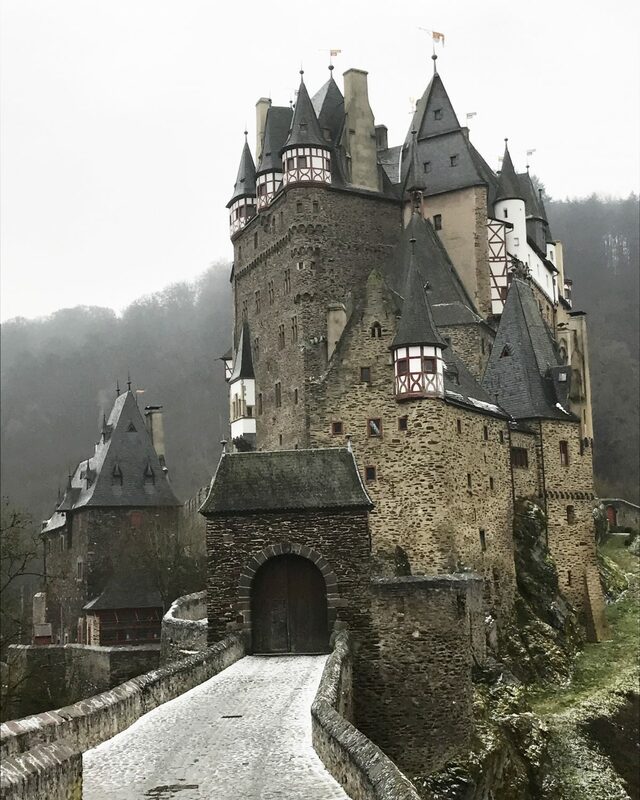 The Burg Eltz is beautiful, powerful and different to all of the castles I had seen before. It gives the feeling that houses are build up onto each other. Around the castle there is a river flowing. All nature, no noises, just the river rippling around the castle. The winter set-up was lovely. The river was half frozen, a little snow was mixed up with the deep green of the pointers and the grass that had survived these cold days. My opinion? An absolute must to visit, but probably better in winter time, when you can take photos without the other hundreds of people around. Get organised! Sure, but how? This is quite off the beaten path! Never heard of this place! Absolutely love that shot, Would love to go and visit quite soon. When do you think will be the perfect time for us to go? It’s so interesting to know we can still visit some of these ancient castles! Burg looks like a great place to spend a day! I love the header picture, it is so hauntingly beautiful in black and white. I haven’t heard of this place at all. But based on your words, this place is quite popular. You look stunning in your winter clothes, btw! What an amazing castle! I saw Neuschwanstein when I was in Munich this summer.The Germans really know how to do the fairy tale thing. And it must be great to go in winter with the quiet. I love the look of this castle. I agree with you that winter would be a good time to visit. No problem parking, no crowds and easy photography. Beautiful photos! Is the inside open to visitors? Even in the winter? what an awesome castle. does it come with its own mad scientist? it looks like it should! Hahaha you’re so right ! perfect film location in my opinion! 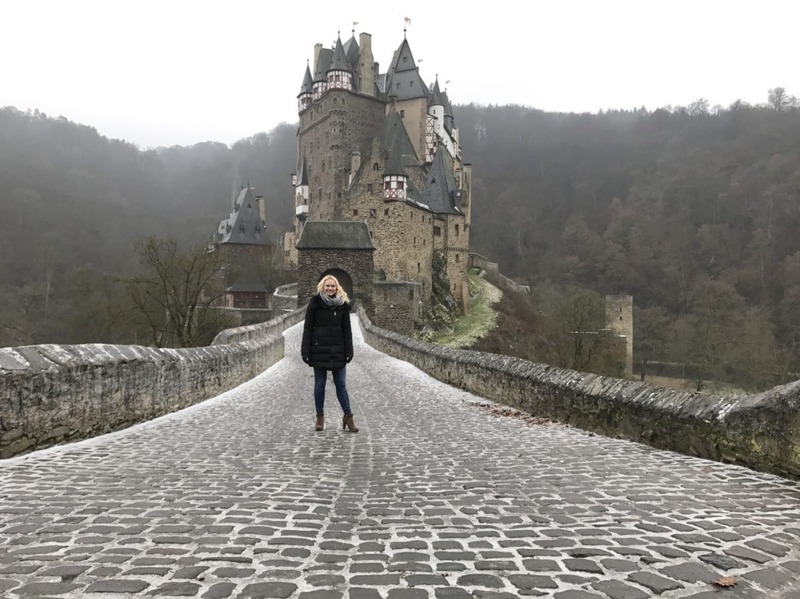 Burg Eltz is a gorgeous private castle! Love it. Thanks for linking up with #wkendtravelinspiration! We’ll see you next week! What a fabulous post! This castle looks great. 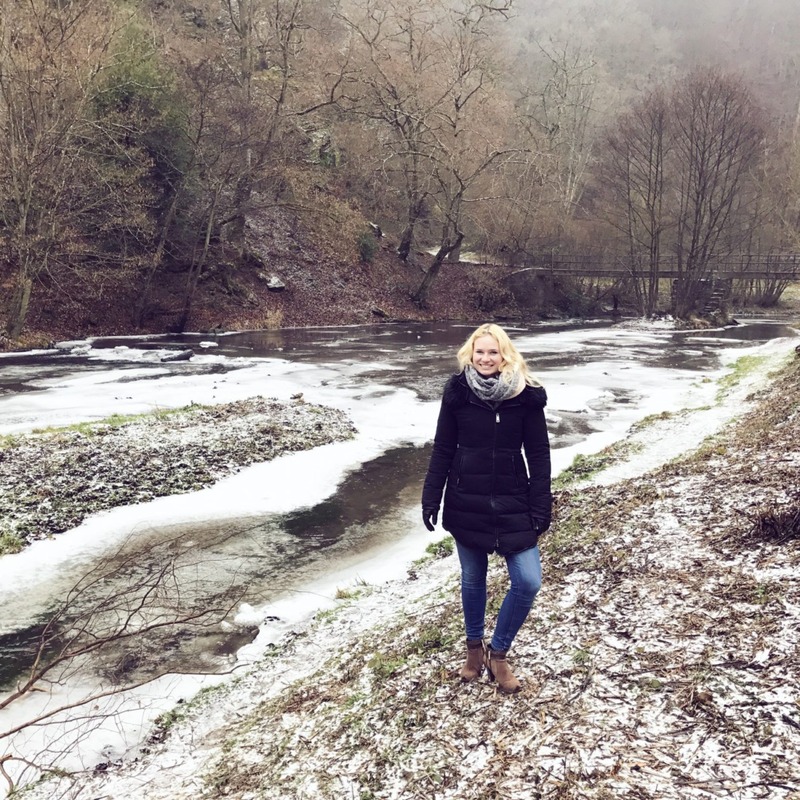 I love exploring in the winter months when you can really experience a place without the crowds, it can be more reflective. Good find!!! The castle looks wonderful down at the end of that cobbled road. I like the idea of no crowds but I’m not sure about the “show up in winter’ part. This is gorgeous! Someplace I would love to visit when we travel to Germany! Thank you for sharing! The castle looks very mysterious and isolated..I would love to know more about it. The half frozen river is lovely. The castle looks so dreamy! Like just out of a fairytale or disney movie! Though it may be less crowded in winter, I guess the sky and colors won’t turn out so spectacular then! OMG. Just look at that castle! So intriguing. Some may find it eerie, but I feel its just way to gorgeous! What a fairy tale location! You can see why Disney used a German castle in their logo – the Germans certainly knew how to build fantasy castles!! 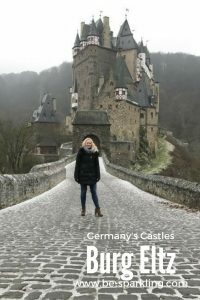 I have always wanted to reach Germany just mainly for the castles! When i went to Strasbourg, France i saw on the plane a castle on a mountain and i know there are lots more in the country, but i failed to see one. I hope a miracle will bring me to my first castle, while still in this lifetime. Thanks. Castles are awesome! But the popular places always have way too many tourists around.